The Object Browser shows running applications, the hierarchy of objects in applications, and object properties and methods. To open the Object Browser, click its tab or select View | Object Browser from the main menu. If needed, you can move the Object Browser to another place within the TestComplete window, or make it a separate window. For more information, see Docking. 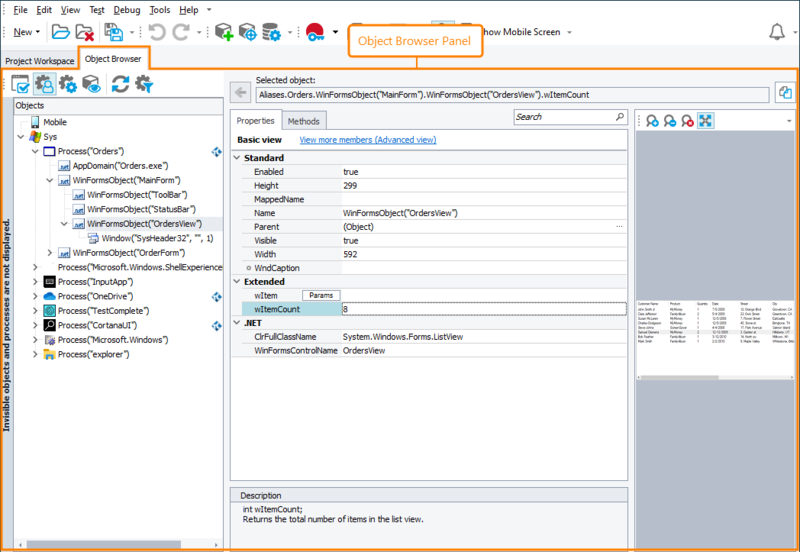 Right-click the process (or any of its child objects) in the object tree and select Add Process to TestedApps from the context menu. Click the Display Process Filter Window button on the Object Browser toolbar and in the ensuing Process Filter dialog specify which processes should be displayed in the Object Browser. Right-click the process (or any of its child objects) in the object tree and select Terminate Process from the context menu. Note: Abnormal termination may corrupt data of the terminated application. Right-click the object in the Object Browser and select Map Object from the context menu. In the ensuing Object Name Mapping dialog specify the name mapping info for the given object. To view the set of properties used for name mapping of the selected object, click the button shown next to the MappedName property of the needed mapped object. In the ensuing Name Mapping Item Information dialog, you can view the set of properties used for mapping as well as their values. Right-click the object and select Show Object in Name Mapping Editor from the object’s context menu. Click the ellipsis button in the MappedName property value cell for that object. For more information, see Jump to Mapped Objects From Object Browser. Select an object in the tree – its image will appear on the right side of the Object Browser. Right-click the object and select View Object from the context menu. This opens the screenshot in the Image Viewer, from where you can save the image to a file or to your project’s Regions store. The Object Browser does not show iOS and Android object images automatically for performance reasons. Use the View Object command to capture their images. WPF object images may be captured incorrectly if the object is overlapped by another object. Right-click the object in the object hierarchy and select Highlight on Screen from the context menu. TestComplete will show a flashing red frame around the object on the screen. In tests, you can highlight objects in desktop and web applications using the Sys.HighlightObject method. Note: Before highlighting objects on web pages, set the browser zoom to 100%. For instructions, see Preparing Web Browsers. Select a window in the object tree and click the GUI Explorer button on the Object Browser’s toolbar. To learn how to use GUI Explorer, see Exploring an Application's Graphical User Interface. Right-click the object and select Store from the context menu. In the Store Object Properties dialog that opens, select the properties to save to Stores. Select the object in the hierarchy and click Save Object Snapshot on the Save\Load Snapshots toolbar. In the Save Object Snapshot dialog that opens, specify the snapshot file name and select object properties and methods to save. Click Load Object Snapshot on the Save\Load Snapshots toolbar. Select the snapshot file you to load. For more information on using snapshots, see Creating Snapshots in Object Browser. To find a certain property, method, field or event displayed in the Object Browser, type an element of the sought-for member name in the Quick Search edit box. The Object Browser will filter out the members according to the text you type. To remove the filter, erase the typed text or press the button.